In rural Wisconsin, there is an old abandoned park. Built in the 1920s, it served as the town’s gathering place for everyone. That is, until a newly developed Train and Tunnel for Tots™ ride was installed in 1932. It was an innocent looking childish train, with one main (mechanized) head car, with three small trolleys pulled behind it. It went around some loops before going into a s...mall tunnel. But this is where the story gets weird. There were numerous cases of child deaths that year, all of them happening after the child rode on that train system. Some kids went missing in that short tunnel (about ten feet), and others went comatose after leaving. One, upon exiting, was found to be dead. Her dress was covered in what looked like small bloody hand prints. Some killed themselves by scratching at their throats until they bled out, and one of them even killed another child before hanging herself with razor wire at the family’s farm. The park was closed, and the town’s popularity as a tourist town plummeted. Recently, a team of scientists were sent out to the park. They taped a video camera to the train, and put a new intern in with it, before sending it on its way onto the tracks. 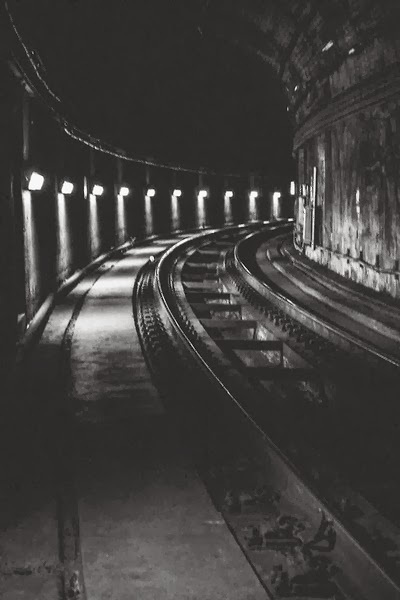 When the train left the tunnel, it was empty, except for the camera. The video was completely black, with very faint sounds of distortion and gurgling. The last ten seconds were nothing but static, except for the sound of children laughing.